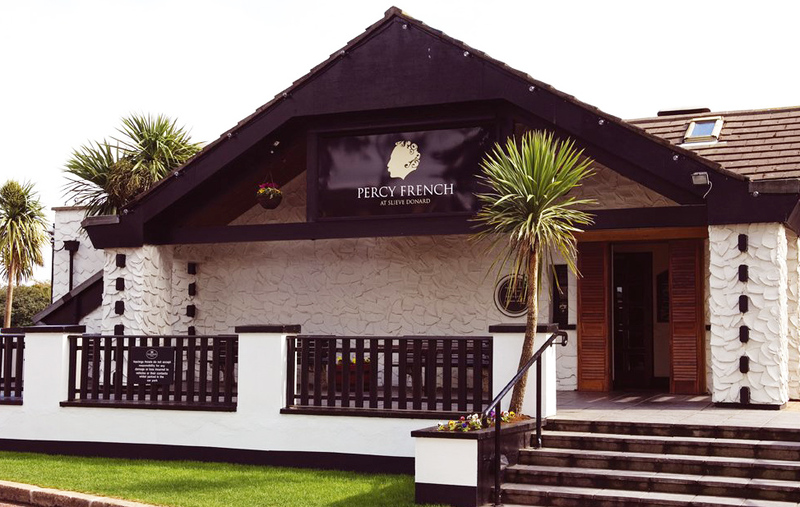 A favourite culinary haunt of ours, and the place where we shared our first date; the Percy French restaurant in Newcastle is a must visit for anyone visiting the area of Newry and Mourne for a day out or weekend break. The restaurant sits at the entry to the majestic Slieve Donard Hotel and is part of the Hastings Group, one of the largest hotel groups in Northern Ireland. We regularly visit the Percy French for lunch and dinner, and thought we would share with you our recent visit to the restaurant. The restaurant itself has a bar and dining area and is one of the quieter spots in Newcastle to enjoy a nice evening meal or a couple of drinks. We recently called in for a spot of dinner and ordered two of our favourites from the menu. Helen opted for the healthier Caesar Salad option while I (Nial) went with the Murg Malai Curry. I love my curries and tend to order a curry from most venues where it is on the menu. It’s just one of the ways that I like to compare different eateries, however, it takes much more than a good curry to impress me. We were greeted by a nice American in the restaurant and he seated us and took our drinks order. Nothing major to report with the drinks as Helen enjoyed a latte while I had to make do with a fizzy orange as I was driving. So we went on to place our order of Chicken Caesar Salad and Murg Malai Curry. You can find out our thoughts on these dishes below. Helen opted for the main course size of salad and it certainly was value for money and a large salad at that. The salad itself was fresh and light and the dressing provided a great balance of flavour without overpowering the rest of the dish. 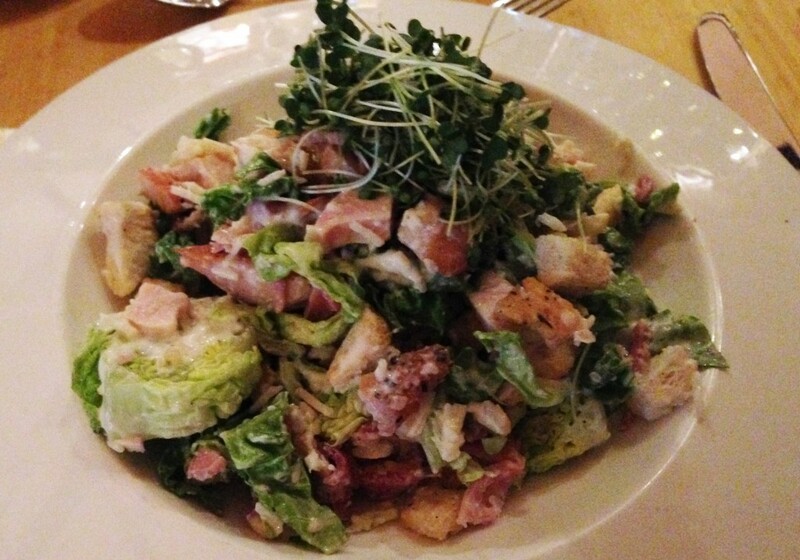 The chicken was moist and plentiful and the bacon, crisp as you would expect, added a sweet and salty element to the salad. There was plenty of chicken and bacon throughout the dish, something you don’t always see in a caesar salad. We would definitely recommend ordering this although if you are not a big eater, consider ordering the starter size. I’ve ordered the murg malai curry on a number of occasions at the Percy French and have very rarely been left disappointed. A was a bit concerned when the dish landed to my table as I didn’t think there was enough chicken, but it didn’t take my long to overcome these worries as there was plenty of chicken hidden away under the tomato based sauce. It was a nice wee surprise and the addition of naan bread and a popadom helped provide a nice contrast of textures to accompany the curry. The basmati rice was as you would expect; let’s face it, if you can’t make basmati then there’s something wrong. I got a side of chips with the dish and they proved to be the perfect addition to run around the plate and soak up the leftover curry. Overall the dish was extremely tasty and left very little room for dessert. 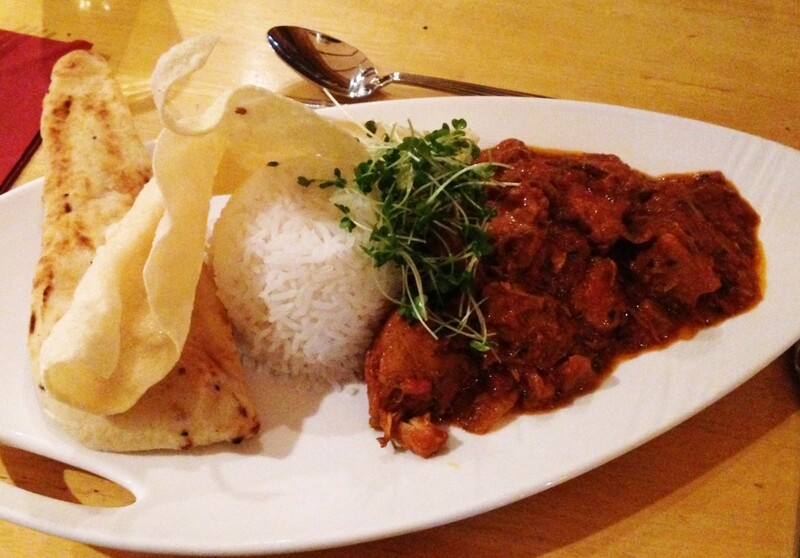 It is a pretty mild curry so if you are looking something spicier then this may not be for you. Otherwise, if you are a curry fan, I’d certainly recommend this dish the next time you are in Percy French. The only thing that may be off-putting for some is the price of the dish but for me, it certainly was worth it and the beautiful surroundings just added that little something extra. As we both have a bit of a sweet tooth, we very rarely finish a meal without a dish, although on this occasion we decided to share, opting for a toffee lumpy bumpy cake. This was our first time trying out this dessert and it certainly impressed. 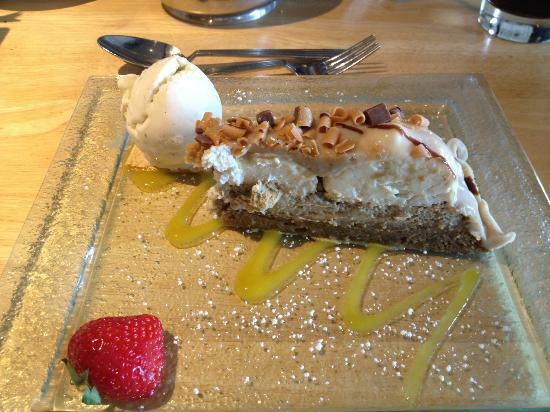 The cake comprised of a toffee sponge topped with a white chocolate mousse, coated in toffee sauce. It was accompanied by a dark chocolate shavings, mango and raspberry coulis, vanilla ice cream and a fresh strawberry for good measure. The bitter chocolate and zingy coulis’ balanced out the sweetness of the toffee dessert. This was another tasty dish and a great way to finish the evening. We will certainly be back to the Percy French in the not so distant future, especially as it is just a stones throw away from our home. For now though, we will be looking to experience other dining establishments throughout the island of Ireland and on our travels, and look forward to sharing these experiences with you. Have you dined in the Percy French restaurant? We’d love to hear what you thought of it and how your meal went. Please comment below or share your story with us by connecting on Facebook and Twitter.